The term pH represents the degree of acidity or alkalinity of water, and part of keeping a swimming pool balanced. What does pH mean for swimming pools? The term pH is a scale of measuring how much of an acid or how alkaline a substance may be. The letters pH stand for “potens hydrogen”, which is Latin for “hydrogen power”. pH is measured on a scale numbered from 0 to 14, with 7.0 representing a neutral value, neither acidic or basic. As the pH level drops below 7.0, the pH is more acidic. As the pH rises above 7.0, the pH is more alkaline. It is important to point out that the pH scale is base 10 logarithmic, meaning at each even number below or above 7.0 pH, the acidity and alkalinity decreases ten times (10x) in strength. A pH of 6.0 is ten times more acidic than the neutral pH of 7.0, and a pH of 5.0 is ten times as strong as pH 6.0. Likewise, a pH of 8.0 is ten times more alkaline than a pH of 7.0, and a pH of 9.0 is ten times more alkaline than 8.0 pH. Maintaining swimming pool pH is critical, and is part of an overall measuring scheme to gauge how well swimming pool water is balanced. The ideal swimming pool pH range is 7.4 to 7.6, with 7.5 being an ideal target pH value. Pool owners need to watch the pH level carefully, as too low or too high pH can cause significant damage to swimming pools. 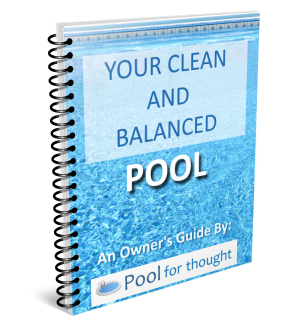 Pools with pH too low (less than 7.4) can experience concrete corrosion, pool wall staining, ageing and damage to vinyl pool liners, plus swimmer eye and skin irritation. 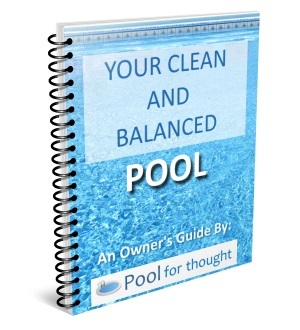 Those with pools low in pH, can also have difficulty keeping total alkalinity balanced. Pools with ph too high (greater than 7.6) often have water scaling issues resulting in plugged filters and reduced circulation due to pipes and fittings becoming clogged, and have issues with cloudy or murky pool water. High pH can also cause swimmer skin and eye irritation, and can also reduce the chlorine effectiveness in the pool.